By accessing the Pizza Pizza Website, you acknowledge this notice and agree, without modification, to all the terms and conditions set out below (collectively called the “Terms and Conditions”). If you do not agree with any of the Terms and Conditions, you should immediately discontinue using this site. Except where stated otherwise, the term “Pizza Pizza” used in the Terms and Conditions includes Pizza Pizza Limited, its licensees and their respective officers, directors, employees, suppliers, agents, affiliates, subsidiaries, successors and assigns. THE PIZZA PIZZA WEBSITE AND THE INFORMATION AND MATERIALS CONTAINED IN IT ARE PROVIDED ON AN “AS IS” BASIS. YOUR USE OF THE PIZZA PIZZA WEBSITE IS AT YOUR OWN RISK. PIZZA PIZZA MAKES AND, BY USING OR ATTEMPTING TO USE THE PIZZA PIZZA WEBSITE, YOU ACKNOWLEDGE THAT YOU RECEIVE NO REPRESENTATIONS OR WARRANTIES, EITHER EXPRESS OR IMPLIED, OF ANY KIND WITH RESPECT TO THE PIZZA PIZZA WEBSITE OR ITS CONTENTS INCLUDING, BUT NOT LIMITED TO, MERCHANTABILITY, FITNESS FOR A PARTICULAR PURPOSE, SUITABILITY, RELIABILITY, AVAILABILITY, TIMELINESS, LACK OF VIRUSES OR OTHER HARMFUL COMPONENTS AND ACCURACY OF THE INFORMATION, PRODUCTS, SERVICES AND RELATED GRAPHICS CONTAINED WITHIN THE PIZZA PIZZA WEBSITE. Even if advised of the possibility, under no circumstances will Pizza Pizza or any other party involved in creating, producing or distributing the Pizza Pizza Website be liable for any direct, indirect, incidental, special or consequential damages that result from the use of or inability to use the Pizza Pizza Website, including but not limited to reliance by you on any information obtained from the Pizza Pizza Website or that result from mistakes, omissions, interruptions, deletion of files or email, errors, defects, viruses, delays in operation or transmission or any failure of performance, including without limitation those that result from acts of God, communications failure, theft, destruction or unauthorized access to Pizza Pizza’s records, programs or services. 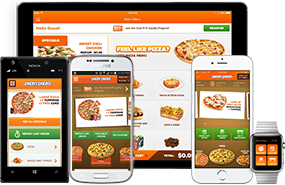 THE PRICES, MATERIALS AND INFORMATION CONTAINED IN THE PIZZA PIZZA WEBSITE ARE SUBJECT TO CHANGE WITHOUT NOTICE AND MAY VARY FROM THOSE PRICES CHARGED THROUGH OTHER PIZZA PIZZA ORDERING SYSTEMS AND FROM LOCATION TO LOCATION. Pizza Pizza Limited owns and operates the Pizza Pizza Website. Pizza Pizza, pizzapizza.ca, pizzapizza.com and related words, domain names and logos are trademarks and the property of Pizza Pizza Limited. All other trademarks, product names and company names or logos cited herein are the property of their respective owners. The material contained in the Pizza Pizza Website, including content, site design, text, graphics and the selection and arrangement hereof are Copyright © Pizza Pizza Limited ALL RIGHTS RESERVED. No material from the website may be copied, reproduced, republished, posted, transmitted or distributed in any way. 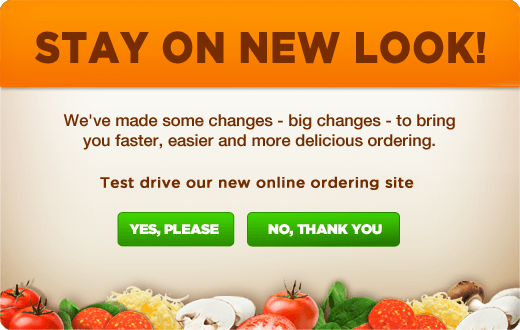 The user may print, in hard copy, portions of the website only for the purpose of placing an order with Pizza Pizza. The use of any such material for any other reason, on any other website, or the modification, distribution or republication of this material without prior written permission from Pizza Pizza Limited is strictly prohibited. -to advertise or offer to sell any goods or services, or engage in any other activities for any commercial purpose. You acknowledge that the communications services are public and not private communications. Further, you acknowledge that Pizza Pizza does not endorse communications by yourself and others, and such communications shall not be considered reviewed, screened or approved by Pizza Pizza. Pizza Pizza has no obligation to monitor the communication services but reserves the right to review materials posted to a communication service and to remove any materials in its sole discretion to terminate your access to any or all of the communication services at any time, without notice, for any reason whatsoever. You acknowledge that any submissions, information, materials, suggestions or ideas provided to the Pizza Pizza Website (collectively the “Submission”) become the property of Pizza Pizza Limited, including all copyright, without reservation, and you waive in favour of Pizza Pizza any and all moral rights in such Submission. You acknowledge and agree that all or any portion of the Submission may be used, edited, reproduced, published, translated, sublicensed, copied and distributed and/or incorporated into other works in any form, media or technology for the full term of any copyright that may exist in such Submission, without compensation of any kind to you. By presenting the Submission, you automatically warrant that you have the full right and authority to submit such Submission, and that none of such Submission is subject to any copyright or other proprietary right of a third party. These Terms and Conditions will be governed and be interpreted pursuant to the laws of the Province of Ontario, Canada, notwithstanding any principles of conflicts of law. You consent to the exclusive jurisdiction and venue of courts in the Judicial District of York in Ontario in all disputes arising out of or relating to these Terms and Conditions and the use of the Pizza Pizza Website. All prices quoted in the Pizza Pizza Website are in Canadian dollars. The Pizza Pizza Website contains links to third-party websites that are not under the control of Pizza Pizza and Pizza Pizza is not responsible for the contents contained in any linked site. Any links provided by the Pizza Pizza Website are provided for your interest or convenience and do not represent or imply any endorsement by Pizza Pizza of such linked site.